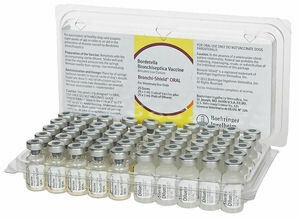 Bronchi-Shield Oral (Elanco) (25 single doses) A virulent live bordetella bronchiseptica. This is the only kennel cough vaccine that can be administered orally. Bronchi-Shield Oral is for protection against bordetella bronchiseptica (kennel cough) in dogs 8 weeks of age or older. Give orally, simply squirt 1.0 ml between cheek and gums (buccal cavity). Annual revaccination is recommended. Requires mixing prior to use.